Steve Jobs (Left) and Bill Gates (Right), the real-life subjects of the 'Nerds' play. Originally set to debut in April 2016, "Nerds" was a production that failed to reach its opening night, with the "loss of a major investor" said at the time to be the reason for its failure. A new lawsuit filed with the Manhattan Supreme Court indicates the project was far from financially secure, and was in fact already in debt. 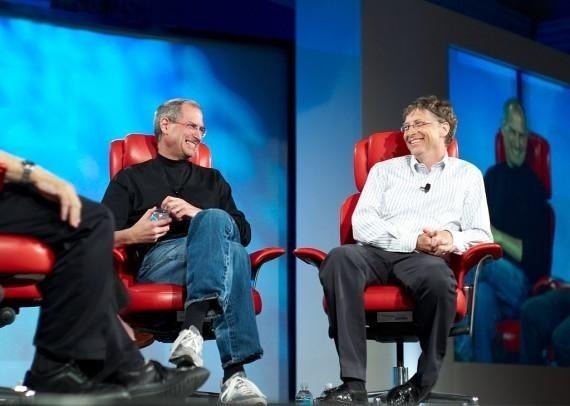 A group of 13 investors have sued Levin for $6 million, for claiming the production had secured some funding from Microsoft, the company created by Bill Gates, one of the two main characters within the play. According to The Hollywood Reporter, there was no such funding in place, and that the project was already in debt by over $1 million, before even holding a public performance. In 2015, Levin proposed a "mini-max" offering, a term referencing a show that had already acquired its minimum operating budget but sought extra revenue as a safety net. In reality, the show had raised just $200,000 against a minimum operating budget of $7.5 million, according to the filing. Despite the alleged deception, the show had received some interest from investors, but quickly ended up spending heftily and putting itself in debt. Paying $600,000 to the Longacre Theatre and $250,000 to Actors Equity for cast salaries were among the biggest items the production paid for, pushing it into debt. The lack of funds apparently didn't deter Levin from insisting the majority of funding was in place on a February 2016 producers' call, alleging Microsoft and the sister of Facebook's Mark Zuckerberg were investors. On March 8, Levin announced the show was closing, a mere two weeks before the first public performances. The complaint filing accuses Levin of leaving "a trail of disappointment, anger, and unpaid vendors" with his actions. The investors in the filing are said to have contributed $606,250 towards the production, including some first time investors, but they all ultimately lost what they put in by the play's mismanagement. Written by Jordan Allen-Dutton and Erik Weiner, "Nerds" was first staged by the Philadelphia Theatre Company in 2005, gaining multiple awards and a limited engagement at the North Carolina Theater. The performance about the long-time rivalry between the heads of Microsoft and Apple, would have included onstage technology including holograms and projection mapping for its Broadway showing, with audience members apparently able to vote on the end of the play via a mobile app.